The meagre sun kept hitting the pan. I often say that the garden holds a very great influence when in its apogee, blame crosswords, over my cooking as I’ll often have to find uses for ingredients that I find myself with a great surplus of. Now, Dear Reader, you know by now that I might be Jack of limitless possibilities in the garden, but in the kitchen I’m greatly hampered, not that you’d know it with the sheer volume of available recipes to be found here, infinitely modest too. I’ve often found myself with odd ingredients, not just strange, but out of place on their lonesome, usually the’re best paired with other foods I can’t eat and other recipes that are out of my dietary reach. Other times the ingredients are there but the recipes aren’t forthcoming or even existent. 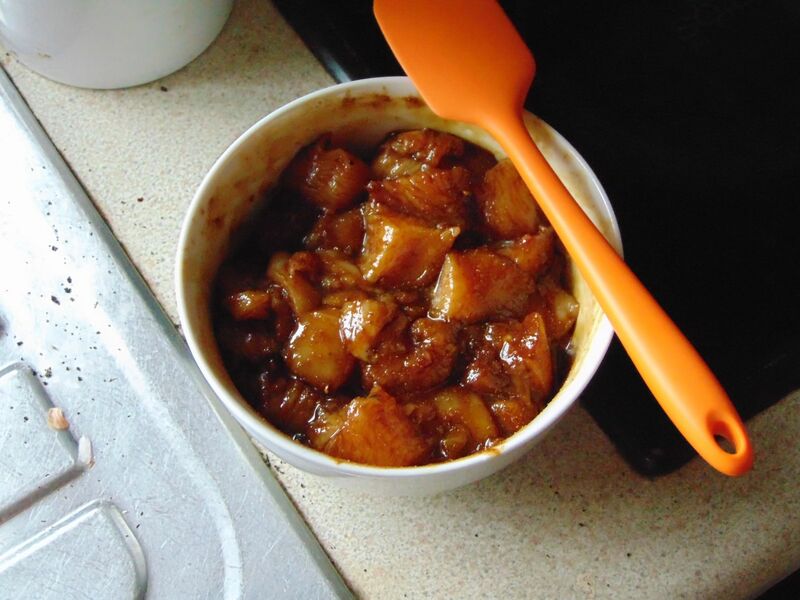 Carob Syrup, Asafoetida and Chinese Five Spice, the last at least is more useful than the first two, but all three have been combined with the garden’s produce to make something a little bit different, what here isn’t?, and really delicious in a different way. Sometimes I forget that spatula tastes of garlic and spoil desserts with it. I’ve actually made this about three times already, I just never measured anything, it was just pure curiosity rather than inspiration. I wanted to see what the five spice, a mild version according to the spice pot, would taste like in different recipe so I’be been sprinkling it here and there. I think what works here is that the star anise and the carob both have a distinct liquorice flavour, the carob’s is very pronounced and the onions, garlic and asafoetida naturally match each other’s flavour profiles, the Asafoetida is mostly used to boost allium’s flavours in curries from what I’ve read. It at times reminds me of the flavouring in Sour Cream and Onion Crisps, but that could be me misremembering, it has been a long time after all, Dear Reader. All in there is a lot of convenient taste pairing here, but it’s nothing very complex, just luck, you can play with the amounts to suit yourself. Browned, hard to get the right shot with the dim light. When I need sun where is it?! As for taste, aside from the aniseed notes, there’s a pleasant warmness, and a dark flavour, it’s the only way I can describe the carob’s other taste notes. I can’t tolerate soy or fermented products so it can be hard to get an aged flavour in food, it’s why I like playing around with Dark Roast Coffee, the carob has a slight bitterness, cut by the honey which also adds the slight stickiness, you could play with intermittently increasing and decreasing the heat to get a different texture, but be careful of burning the honey. The onions and garlic just melt into the chicken, coating and keeping it moist. It’s what I think of a “Shovel In” kind of dish, you just keep eating and eating and then it’s gone. 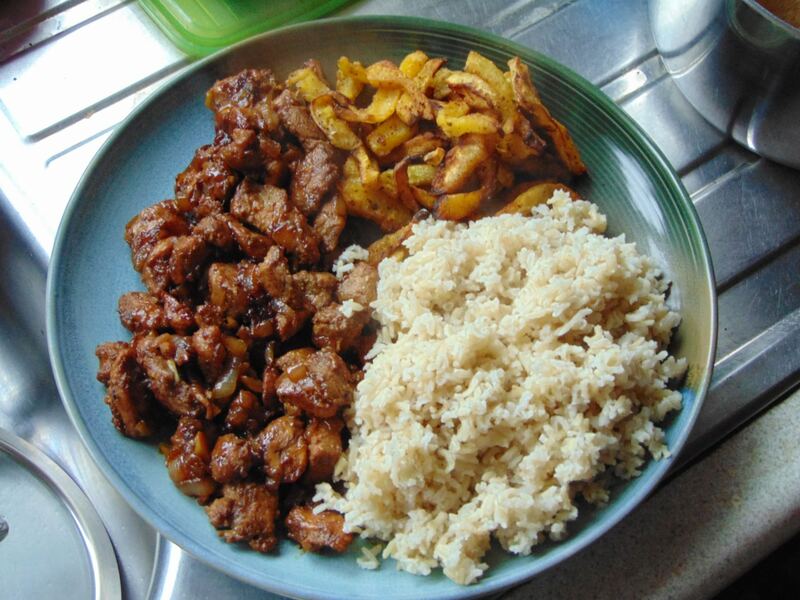 I had it with rice and squash, getting low on squash sadly, and it works really well with a plain side. An entire squash. Eat good food and you’ll do fine is my motto. On the whole it’s just a little different from what I’m used to, which when you’re as restricted as I am you’re really grateful for, I’m sure I have no need to tell you, Dear Reader. I’d buy more carob syrup as it’s just all round easier to utilise than the powder and has a stronger, more intense flavour. If I were to play with the recipe I’d add some shallot, maybe some Sichuan Flower Pepper for some additional kick. You can use it as a guide or just go to town and create something completely different from this. I had deliberated with myself as to its worth as a recipe, but when I realised that savoury carob syrup recipes are scarce, strongly flavour recipes that aren’t high in histamine are too, well, I thought why not? My Dear Readers aren’t finicky and might find it interesting if nothing else. I’ll be back again later, Dear Readers. 1. Mix Carob Syrup, Honey, Five Spice, Asafoetida, Salt and Pepper together in a bowl and then add Chicken and stir until completely coated. Set aside. 1. 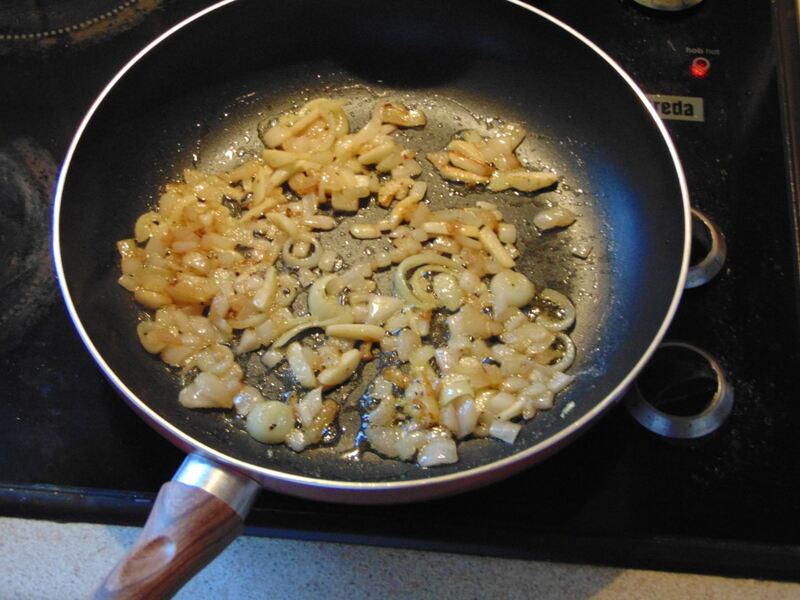 Add Butter to a frying pan and when Butter has melted add the Onion and Garlic. 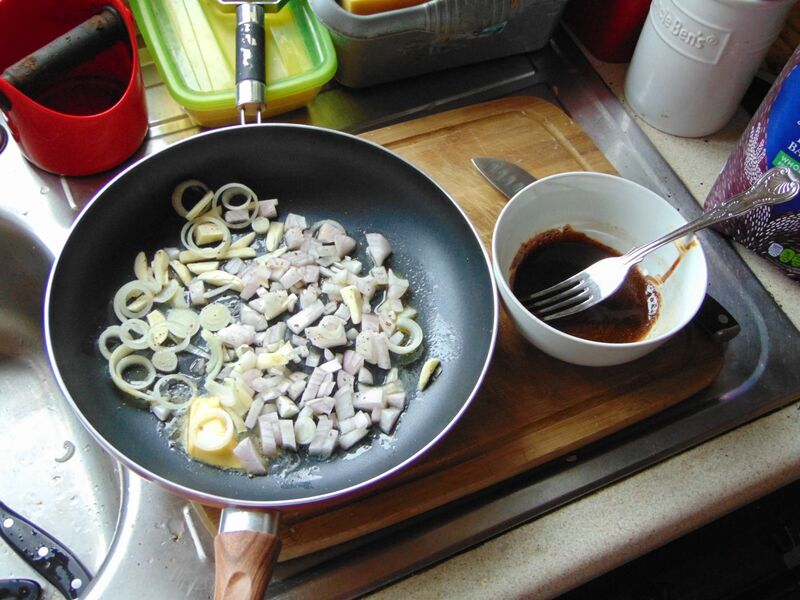 Cook Onion and Garlic on a medium-high heat until browned, about 20 minutes, then add Chicken. Reduce heat to a medium and cook until chicken is cooked through and slightly sticky.